Some days call for soft yarn. While checking my downspouts in the backyard and moving the white stuff away from the foundation of the house, I lost my keys somewhere in the snow, slush and ice. After much hunting, I've concluded that they're hibernating. I called a locksmith. Apparently, I have good locks and he couldn't unbolt them. Take note, all ye local burglars. My niece ended up saving the day by driving me to my brother's house, using her key to get in -did I mention that my key to my brother's home was on the lost keyring? I picked up his spare key to my place. I know; I should have had another hidden in a safe spot in my garden. It's hardly an earth shattering tale of woe, but I wanted my blankie. Actually, this yarn is for a baby blanket gift, but the softness makes me want to wrap myself in it. The project, using Bernat Baby Blanket Yarn, is being knit on a large circular needle (8 mm), hence the curlycue jumble you see here. If all goes according to plan, there will be cables dancing across its surface. Note: Thank you very much to all who have chosen to follow this blog. For those interested, various means of doing so are provided in the right hand sidebar. I do hope you find your keys Karen. Thank goodness you were able to get your extra one and get back into your home. Claire looks so comply in your house now. The blanket is going to be lovely. Oh my, I hope you find your keys before the spring thaw. Every day on our early morning walk there are people on the beach with metal detectors - where is one when you need it! Claire is sweet soaking up the sun with a slit of green eye showing. 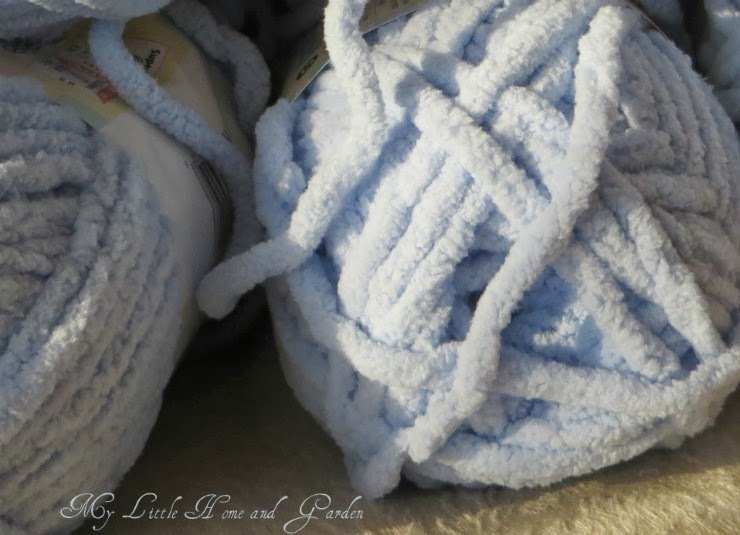 First thing I though of when I saw the baby blue yarn is a blankie . Oh my what a thing to have happen with your key's. 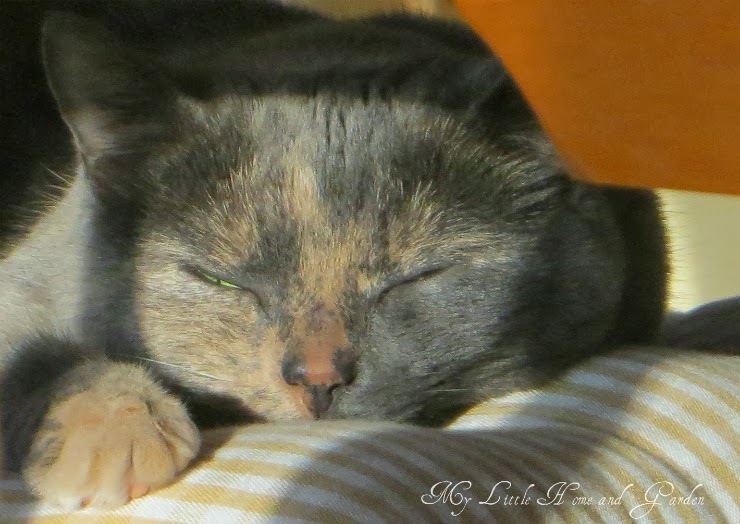 Oh sweet Claire sunning in a sun puddle . Papa and I will be hooking up again for Sunlit Sunday on Sunday lol ! Thanks for sharing and hosting , lovely photos .Have a good week ! Hi Karen, Oh, Claire is such a sweetheart. Look at that face and cute little nose! 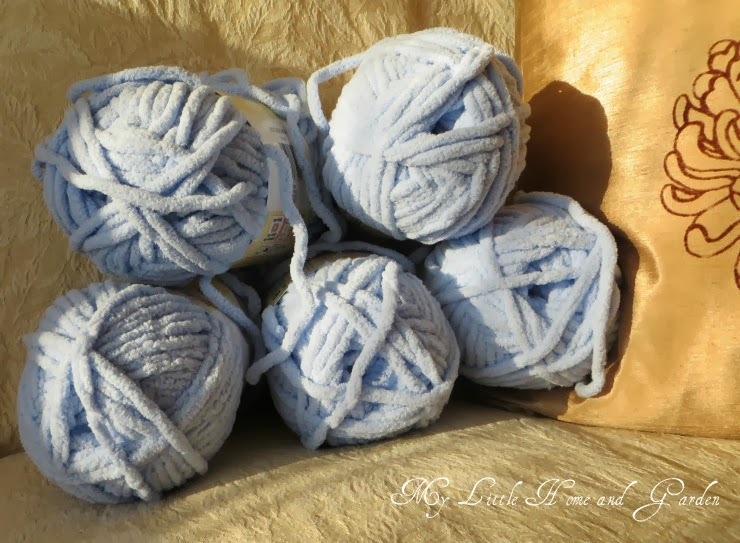 Love the texture of your blue yarn. Can't wait for you to share the finished project. That's terrible about the keys. Love the photos- especially the kitty with the little green slit showing in the eye! I would have wanted my blankie too Karen! That's a beautiful blue and will make a lovely blanket. I notice that Claire is keeping a tiny bit of her eye on you - she might know where the keys are! It's hot and very very windy here today! I want to be Claire! She looks so comfortable and happy. Isn't it a scary feeling to be locked out of your house in the cold weather? I fingered a bundle of that exact same yarn this week at the store and tried to come up with an excuse to buy it. It's so very soft and inviting, but I already have more unfinished projects laying around than I care to admit, so I exercised restraint. I'm glad you get to cuddle with it. The yarn looks so soft and cuddly - perfect for a new baby. Losing one's keys is a wretched nuisance. I do hope yours turn up before the snow thaws. Well, you lost your keys, for now, but you found a cuddly and adorable little kitty, who is the key to your heart! The snow will melt, and your keys will appear, in the sunlight of the rays of spring! Thanks for hosting and have a lovely week ahead! Love the kitty...Claire!!! She's beautiful. He needed new frames, so it was a "good thing," actually. Your post warms my heart. Love yarn and what I can do with it. Sorry about the keys, they will return when the snow melts.. I love your pretty kitty, lovely shots. Have a happy Sunday and week ahead! That yarn looks extra soft and I bet it is fun to work with but your cat napping in the sun brings warmth to the soul. We can learn a lot from cats. They eat only when they are hungry and when it is nap time, they find just the right place. Glad that you got in your house and that you found out that no one else will be able to. Love your yarn and can't wait to see the end product. Thanks for hosting. The yarn does look cozy and will make a lovely baby blanket, Karen. I hope you're enjoying a sunlit Sunday there. It's sunny here but -18C. I'm inside enjoying the sun shining through the slatted blinds. Karen - some really great submissions this week! We had some sun in our area this week, but I was too busy planning for incoming family this weekend...I hopped over and checked out all the talent here and was very impressed - this is a great link up! Thanks for this lovely blog party. Enjoyed visiting all the different posts this week. So many different ways people see sunlight. 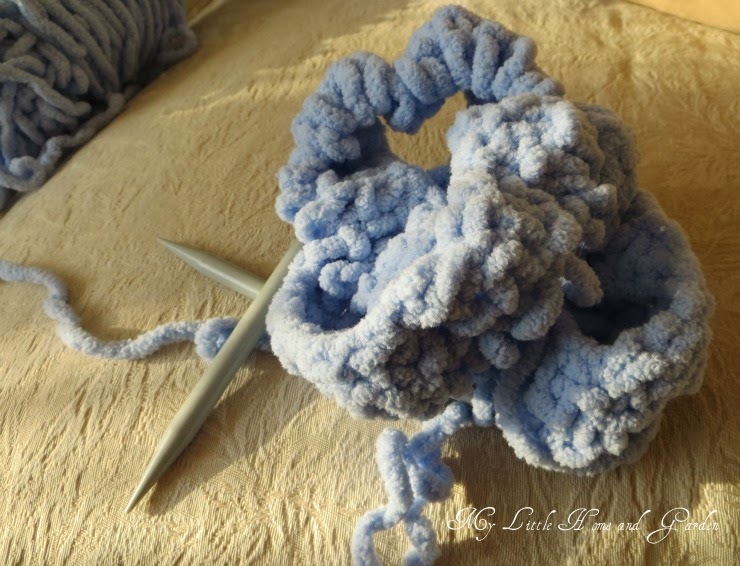 Your photos make me miss my crocheting days! I might have to change that. And your little furry baby is so adorable. oh- that yarn looks cozy! those cats always find the right place to sit eh? We had a similar case. We have a lock on our door (reset type). so one cold night we come home and my key would not work, hidden key would not work. Well my husband figured a way to get in ( will not share) do not want robbers lurking the internet to get ideas :) And after a long time got into our house. Someway the door lock after many yrs. of having it decided to break inside the lock area. So my husband went down and bought a new door knob and lock and it is not a reset type and they set the new lock to match our keys we had. It is not fun loosing keys nor getting locked out. Glad you got back into your home. Oh that yarn looks so soft and Clare just looks so sweet. Love the one eye slightly open. Love your soft yarn and sweet kitty......so cosy and homely. I'm sorry you lost your keys and were locked out of your cosy home....such a stressful thing to happen and to resolve. I'm glad you were able to get back in at last, Karen. Love your sunny photos here......hope you are having a sunny week too.